The Prisoner: "Once Upon A Time"
Rover has always been the perfect symbol of the Village's authority, at once ridiculous and deeply unsettling. Seeing it sitting in Number 2's chair at the start of "Once Upon A Time" is one of the great "laugh out loud and shudder" sight gags of the whole series. It signifies a game change, but that requires a bit of deduction on the part of the viewer; what's more immediate, and therefore more powerful, is just how perfectly the damn thing fits in the chair. We've been seeing that chair since the very first episode, and its roundness always looked like a parody of futurist design conventions. It's very mod, one might say. But here we have revealed the true reason behind its curious form—if Rover ever visits, it needs a place to sit. 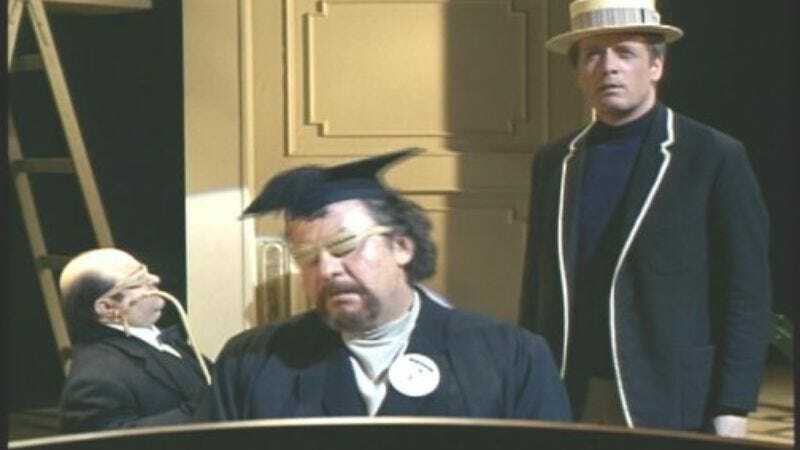 Leo McKern is back as Number 2, and it's delightful to see him again. But he's agitated, angry, snappish. "I'm not an inmate!" he shouts, and here's a tip—if you ever have to shout that, you are in a very bad spot indeed. Pressure is mounting, Number 1 is presumably growing more and more insistent, and 6 still refuses to break. Something must be done, because Rover is watching, and the red phone awaits. While we've had repeated 2's before, this is the first where it seems like a matter of conscious choice, an actual plan. Of the group, McKern came the closest to getting 6 to confess, so having him back, and exploiting the oddly cordial relationship between them, is an understandable strategy. McKern isn't very happy about it, though, because he realizes that there's no other choice now but to put himself at risk. No more con games, no more tricks. It's time for "Degree Absolute," another one of those can't-be-good-news phrases. I loved "Once Upon A Time" when I first saw it, and I very much enjoyed watching it again for the recap; I think I initially took to it because it is such a unabashedly theatrical piece of work. I was big into the theater in high school and college (it was one of the few places where being loud actually meant I was valuable), and I remember liking a lot of the plays I read not because I necessarily understood them, but because they were very intense and shouty and had people doing horrible damage to each other with words. Who's Afraid Of Virginia Woolf? blew me away. I wasn't really sure why, but I loved how nasty it was, a horror movie without any violence or ghosts to speak of. "Once" is like that. It's got all kinds of meaning in it, but boiled down to basics, it's just these two immensely talented actors trying to psych each other out. Some of that intensity apparently lingered into real life, as McKern suffered a breakdown while filming the episode. He certainly doesn't look well. I recently received the new Blu Ray box set of the series, and it's excellent, a big improvement over the so-so A&E DVDs, but with the increased visual clarity comes a far more unsparing look at the actors. McKern's face is gouged and sweaty, and every close up of him has you wondering when the heart attack will strike. But while his actual health problems are regrettable, they fit in with the tone of the episode. 2 is on the run, and cornered. Given that we start in his office, in a way we're seeing everything that follows from his perspective, not 6's. It makes "Once" into something of a tragedy. "Degree Absolute" is a fascinating concept, and often an elusive one. The basic idea, as explained by McKern (but only near the end, after 6 has essentially won the game), is to regress the subject to a childlike state, and then run him through the stages of man as described by Shakespeare, working to establish a connection between him and 2, which 2 can than use to get deeper into 6's mind. 2 makes reference to psychotherapy, and given that "Once" was written and directed by McGoohan, and given the way "Degree Absolute" ultimately ends up, you can't help thinking that McGoohan isn't very fond of psychiatrists. There is a disdain in this episode for the notion of breaking down a man into a set of separate influences, of attempting to dismantle a personality like some complicated washing machine. Really, though, whatever you feel about psychiatry in general, this is not the sort of tack of take with 6. His relentless individuality is fractal—iterations of it remain even, one suspects, at the sub-atomic level. 2 cajoles him as a child, exhorts him as a teenager, lectures him as an adult, uses the full weight of whatever authority can be brought to bear down on 6's skull, and none of it works. We do get more information about 6's resignation—he says he quit "for peace of mind," and "Too many people know too much." That makes sense. It's logical that someone as determined and driven as 6 would be drawn to be a government agent, a dangerous and important job, and it's just as logical that he would leave the position once he realized the homogeneity he was working to ensure. Again, we're reminded that, as strong as 6 is, one of the main reasons the Village fails to break him is their way of thinking makes 6 essentially unknowable to them. Much of the dialog of "Once" is given over to rhythmic repetition, partly because that's a good way to get under someone's skin, and partly because it sounds cool. I know that "Fall Out" sets the standard for the series in terms of flat-out weirdness, but while it has a clearer framework supporting it, "Once" is still pretty damn impressive. There's a great exchange between 6 and 2 when 2 is set-up as a headmaster; 2 orders 6 be given 10 lashes for not ratting out his friends, and 6 responds with, "12, sir. So that I can remember." But the best conversation happens near the end, once 2 is thoroughly beaten (and he seems grateful to have lost, really), and 6 is getting the closest thing to an honest conversation that he's ever had with the forces that run the Village. "You're free," 6 says, and McKern responds, "No, I'm Number 2." It's almost as though we're being given complete permission to like McKern here. Despite the convictions he stated in "Chimes" about believing in the cause, it turns out deep down he's just as much a prisoner as 6 is. Maybe even more so. Then 2 dies. It's—strange. Because somebody's shouting "Die!" at him off-screen, and the shouts, which coincide roughly with the end-of-the-week deadline of the "Degree Absolute" program, are apparently what cause him to collapse. But who's shouting? It could be 6, but he looks as surprised as anybody. I think it's Number 1, myself. Whoever it is, though, 2 is dead, and 6 has won. All that's left now is to claim his prize, and meet the man (or woman) behind the curtain. So, do you think everything we see here, from the bank job to the war service to the time as a POW, is part of 6's history? The Village obviously has the records for it. 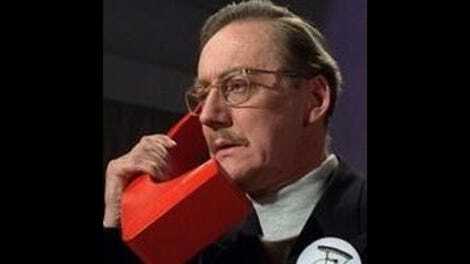 McGoohan refuses to say "6" for a good portion of the episode. It seems like a form of resistance, but then he only really beats 2 when he starts saying 6 again. Gotta love the plan 2 writes down on the chalkboard: "A. Find missing link B. Put It Together C. Bang!" Next week, we come to the end with "Fall Out."